Dighton has multiple reasons for the best season in school history, including increased weight room time, development in the second year of a new defense, and improvement from one of the best statistical passing combinations in eight-man annals with senior quarterback Tyler Lingg and senior wide receiver Dylan Foos. Lingg has completed 74 percent of his passes this year and 62.7 percent in his career, well ahead of the eight-man state career mark of 60.7 set by Kensington’s Kirby Rust from 1986-89. As well, Foos has 27 receiving touchdowns this fall, two off the eight-man mark of 29 set by McCracken’s Kellye Irvin in 1979, according to the Kansas Sports Hall of Fame. For Hanover, it’s the usual under 12th year coach Matt Heuer – another dominant team on both sides that reaches the state championship game – and unfortunately some continued uncertainty health-wise deep in the playoffs. Hanover fell to Central Plains and Spearville respectively in the Division I contest the last two years. In the ’14 game, the Wildcats lost fullback Cody Rengstorf to a knee injury during the Central Plains defeat. Last year, Hanover defensive leader Adam Zarybnicky was injured in the playoffs, and he didn’t play in the state game. Last week, senior quarterback Will Bruna was hurt with 4 minutes, 2 seconds remaining in the first half on an attempted tackle. Bruna is a two-year starter and set eight-man records for single season yards and touchdowns last year. Sophomore Daiken Stallbaumer played the remainder of the game in a 48-0 win against Pike Valley. Bruna could be a game-time decision against the Hornets, in their first ever title. On Saturday, Dighton (12-0) will play Hanover (11-0) in the Eight-Man, Division II state championship game at Newton’s Fischer Field. Start time is 11 a.m.
Hanover is 2-3 in state title games under Heuer, including 2-0 in Division II matchups with victories in ’07 and ’08. This season, the Wildcats have permitted 50 total points, best in Kansas. From ’06-15, just two eight-man teams won a state title and permitted under 100 points in a year. “This group has done a very good job of utilizing the feeling that they had walking off the field the last two years and that’s maybe driven them throughout the entire course of the year,” Heuer said. Bruna has passed for 1,525 yards with a 26/3 TD/INT ratio. He is also the team’s second-leading rusher with 549 yards - 50 behind junior Kevin Diederich – and a Wildcat-best 13 rushing scores. The offense has averaged 49.7 points per contest after it tallied 58 a game in 2014 and 53 per contest last season. However, on a per-play basis, Hanover is on par with the last two years. In ’14, the team averaged 9.6 yards per play and came within six points of tying the eight-man single season scoring mark. Last year, Hanover was at 8.95 yards per play. This season, that mark has improved to 9.03. “With the way that our defense has played throughout the entire season, I think that it’s kind of overshadowed the way that our offense has played,” Heuer said. Heuer said his back five defensive players have been flexible and allowed Hanover to make changes on a week to week basis against opponents. Multiple defensive starters and offensive skill players are in their first year as starters. Hanover’s defense has forced 33 turnovers, including eight interceptions from Stallbaumer, a starting cornerback. He had one last year and started in the playoffs as a freshman after Zarybnicky went down with injury. Senior linebacker Adam Fritschi leads the team with 83 tackles, while Zarybnicky, the defense’ hybrid player, has 63 stops. He is normally the monster back, or safety, but has sometimes played closer to the line in run support. Heuer said Zarybnicky has great intelligence, a staple of the unit. Junior Carlos Emanuel has started at nose guard for the second straight fall and played well. He, Fritschi and Zarybnicky have combined for 30 tackles for loss. Senior Jesse Stohs (46 tackles) is a first-year starter at defensive end. Senior Trevor Klipp is back for his second season at center and defensive end. “We are a lot more physical than we were last year, and I think our kids understood the importance of that side of the ball and really stepping up and limiting the opposing teams’ opportunities,” Heuer said. Dighton, with just 14 players, has a roster roughly half of Hanover. The Hornets bumped from 5-4 last season when it was in the last of a two-year co-op agreement with nearby Healy. The Hornets had made sub-state just once, in 1995. 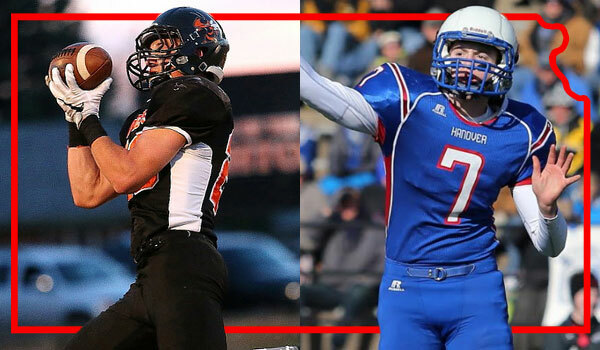 Dighton was considered upper echelon throughout the fall but was not ranked until midseason. “What I am most proud about with these guys is just the commitment,” sixth-year Dighton coach Ken Simon said. “Because to be good, you have got to put a ton of time in, and you’ve got to put the effort in, not just on the field, but right in (the weight room). Lingg has completed 143 of 194 passes for 2,052 yards with 43 scores against four interceptions. Foos has delivered another great season with 78 catches for 1,230 yards and 27 scores. In his career, Lingg has is 357 for 569 for 5,070 yards with 78 scores against 19 interceptions. Foos has 193 catches for 2,938 yards and 50 scores, seven off the career receiving list set by Central Plains’ Layne Bieberle, who graduated after 2014. Senior Lake Lewis has 89 carries for 700 yards and 14 rushing scores, while sophomores David Cramer and Dalton Hoffman have combined for 42 catches and 14 receiving TDs. The running game has averaged 6.4 yards a carry and 163 yards a game. Last year, the Hornets had 4.4 yards a carry and 125 rushing yards a game. Dighton allowed 29 points a game in 2015 and is at 12.3 a contest this season behind the improvement in the 3-2 defense. Tyler’s brother, junior nose guard Logan Lingg, and Tyler at defensive end each lead the team with eight tackles for loss. “That kid is just a beast in the middle,” Simon said. Junior defensive end Isaac Torson, the team’s second-leading tackler, suffered a likely head injury near the end of the Wallace County victory last week. “Last year was a building year, we first introduced it last year, and now we’ve got a real feel for what’s going on and how it should look,” Tyler Lingg said.